Passengers have been told by rail companies not to travel by train this Easter as the closure of major routes will cause chaos. Beleaguered travellers have been warned that ‘Easter is cancelled’ as far as trains are concerned and many key services will be axed. On others they face hours of delays, with some journey times quadrupled. Worst affected will be the West Coast main line, where Virgin Trains has told passengers not to bother trying to travel. 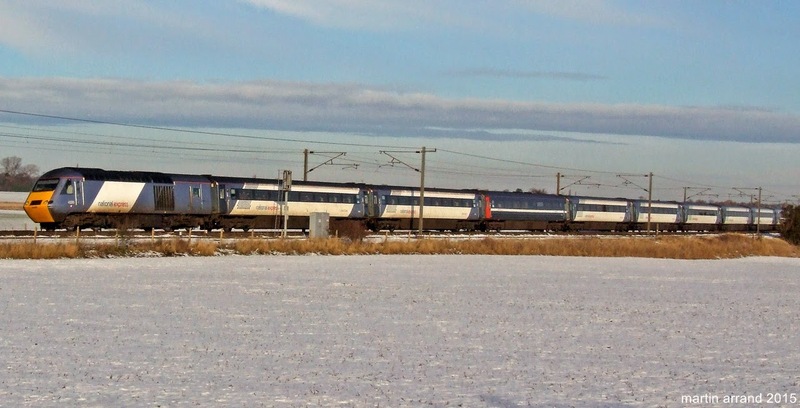 The line between London Euston and Milton Keynes will have a four-day shutdown. On Easter Sunday a 55-minute direct trip from Rugby to London Euston will turn into a marathon lasting four hours and 20 minutes, with two trains and two buses. A Virgin Trains spokesman said: ‘Easter is effectively cancelled – our line is shut. We’re advising people not to travel. 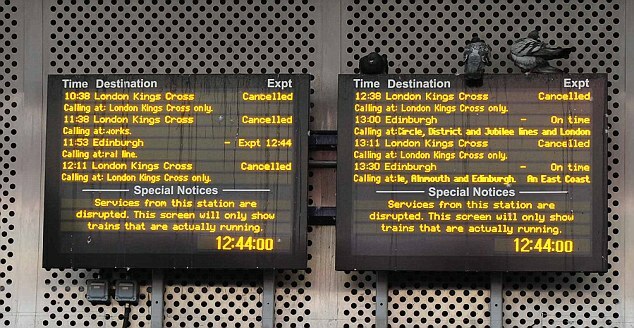 Other services blighted by engineering works include London Midland, which uses the same West Coast line and has issued a similar warning, and swathes of the Great Western and Greater Anglia lines. Virgin services to Manchester and the North West and Birmingham are also badly affected with diversions adding heavily to journeys. Network Rail chief executive Mark Carne apologised for disruption from the £100million works by 14,000 engineering workers, but insisted it was vital. 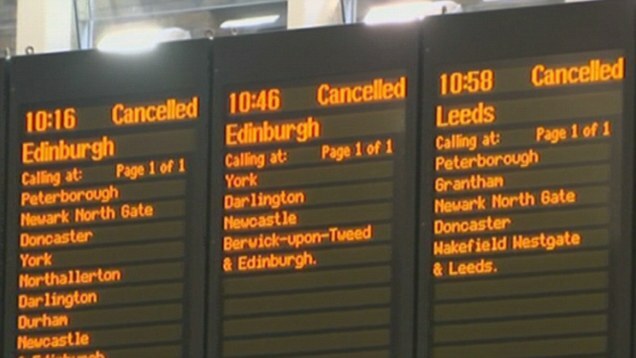 However, the warnings have brought fears of a repeat of the last fiasco endured by 115,000 passengers at Christmas when the key East Coast main line was crippled by overrunning engineering works, prompting a major inquiry, damning rebukes from ministers and watchdogs, and a grovelling apology from rail bosses. Engineering works on the line between Crewe and Warrington and from Carlisle to Glasgow will ‘severely reduce services to the North and Scotland’, it said. Services are also likely to be ‘extra busy the day before and after affected days’ and passengers should book early. 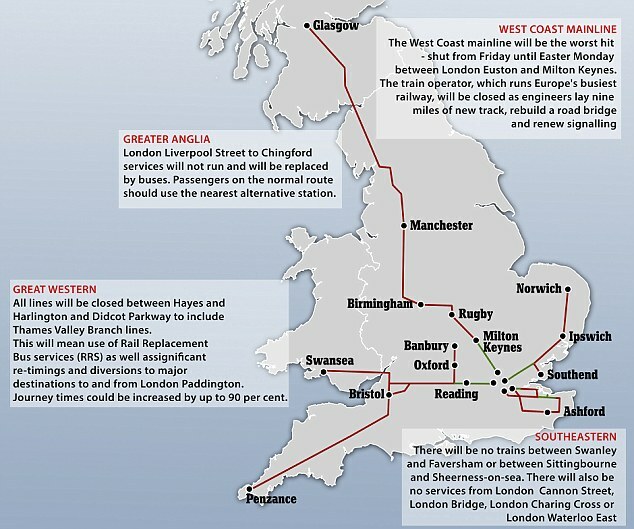 West Coast passengers also face major works at Watford Junction from an £81million programme from Network Rail ‘to improve the ageing infrastructure’. Rail bosses say carrying out works during Christmas and Easter is justified as passenger numbers are down by up to 40 per cent because there are far fewer commuters. But ministers have suggested carrying out such works at times other than at Christmas and Easter – such as through the summer – to avoid hitting families travelling during the key holiday periods. He insisted that there were ‘good contingency plans in place’ while the improvements are carried out.